The Pyrenees mountain range has some excellent rides including stretches offering numerous hair-pin bends and spectacular views. Col d’Aspin, Col du Tourmalet, Pic du Midi Observatory, Col du Soular, Col d’Aubisque, Cirque de Gavarnie, Col du Mente, Col du Payolle and Pont d’Espagne where you can see rushing waterfalls from the mountains are all wonderful places to ride. Plan a route taking in some of the interesting towns of the region like Bagneres-de-Luchon, Bagneres-de-Bigorre, Lourdes, Pau, Argeles-Gazost or Tarbes. You could even go right across the mountains into Spain to join the N260, just be sure to have your passport with you as the Spanish police will need to see it if you cross the border. Brittany is full of lovely routes for bikers. Choose coastal roads with dramatic views and ride the quiet country lanes between the pretty towns and villages of the region. French drivers are usually considerate towards bikers and there is less traffic than you’re used to in the UK so you can look forward to relaxing rides enjoying the scenery. Keen riders can try the epic 200km route from Plestin les Greves on the northern Brittany coast right down to Huelgoat and the Crozon peninsula in south west Brittany. For shorter routes stay at a central Brittany cottage and set out on day trips to visit towns like Brest, Quimper, St Malo or Morlaix, or to see famous sites like the Carnac stones. Plan a biking break in the Loire and you can enjoy winding roads through the beautiful countryside taking detours to see the famous chateaux and vineyards of the region. You’re also close enough to visit the iconic racetrack at Le Mans and take a turn on the route of the iconic 24 hour race circuit or watch some of the exciting motorsport on offer. The N138 is a favourite road in the region with a good range of terrain for bikers including long straights, sweeping bends and rolling hills. 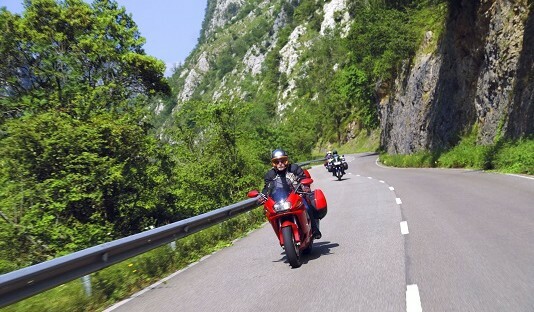 For more ideas on routes for bikers why not take a look at Brittany Ferries’ guide to motorbike touring in France? Pack carefully making a list of items stored in each pannier/top box and weigh the contents to ensure an even distribution for a safer, more comfortable ride. Choose an overnight ferry crossing and book a cabin so you have somewhere to store your helmets, leathers and luggage safely, and get a good night’s sleep so you’ll arrive fresh and ready to ride! Tie a ribbon or put a bit of tape on your left hand mirror as a visual reminder to drive on the right – it’s easy to forget on an empty road! Book a Brittany Ferries crossing when you plan a biking break staying at one of our many B&Bs or self-catering holiday cottages and you’ll get 20% off the cost of your ferry travel! Many of our holiday property owners welcome bikers and can offer great tips on local routes, restaurants and rides that you’ll want to try.